What do you wear while you are relaxing at home? Long ago, I started throwing away anything that was stained or showing signs of too much wear. It is important that we dress nicely and look good for our families and ourselves all the time. Why should the public see you at your best, while your family only gets to see you in baggy pajama pants and a stained tee with no makeup? If you live alone and work from your home office, you may ask, “Why should I make the effort?” I get dressed for myself each day because good grooming and an optimistic outlook go hand in hand with self-respect and happiness. I may not put on much makeup on the days I am not planning to leave the house, but I do shower, get dressed, cleanse, moisturize and use a lip balm every day. Do you save your best for later? Why should we? All days are special, and I have worked very hard for everything I have. Living an elegant life is being happy with what you have and enjoying using your best items. Part of my weight loss journey includes sitting down to a properly set table, relaxing and mindfully enjoying my meals with a background of soft music and taking the time to appreciate the moment. I do not eat while standing, walking or driving. I wore this look on Sunday to relax at home and then to visit my parents later in the day. The narrow V black tunic is by Clara Sunwoo via ShopMyFairLady.com. (Your discount code for 15% off for this month is August17.) The Disney inspired leggings by Lularoe were a gift from a very dear friend. She knows all about Mr. Mickey’s life-long habit of acquiring Mickey Mouse antique toys. His collection is the second largest in the world and it is now for sale here. Leggings are a great alternative to sweatpants in the winter but perhaps too hot in central Illinois this time of year. My uniform in the summer is shorts and tee shirts, however, you are right…I definitely need to purge a few items. Such a cute look & comfy too. Mr M’s collection is an amazing achievement, and he is certainly a charmer with a great sense of humor. Thouroughly enjoyed your post..great advice. Thank you! I live in chilly, wet Britsin. I have fibromyalgia so clothing can feel painful at times, no matter how well fitting. I’m planning new pants and tips for Autumn/winter days spent at home. My top priority is soft fabrics and then being able to layer due to trouble controlling my body temperature. Really like your Mickey Mouse leggings ! Great post! I agree, I love to dress for dinner (not formal) each evening because each day is a celebration. My friends think I am crazy! Ha ha! Peace! Yes, yes. In this age of the sloppier the better, pjs at walmart, and “I can wear what I want regardless of how it looks,” you are a breath of fresh air. You look fabulous, and I agree that it makes a difference in how we feel. You are so inspiring. Seriously, morning TV needs to do a segment with you because people seem to have no clue what looks good anymore. Totallly agree with your outlook. I always feel my best when I look my best. It doesn’t matter if I’m out in public or alone doing housework. Your outfit is casual yet super chic-love it. I do love your look and your outlook on putting your best foot forward every day. This summer, I have gotten off track and am finding it difficult to get back in my groove. Maintaining a sunny outlook has been challenging, but is a top priority. 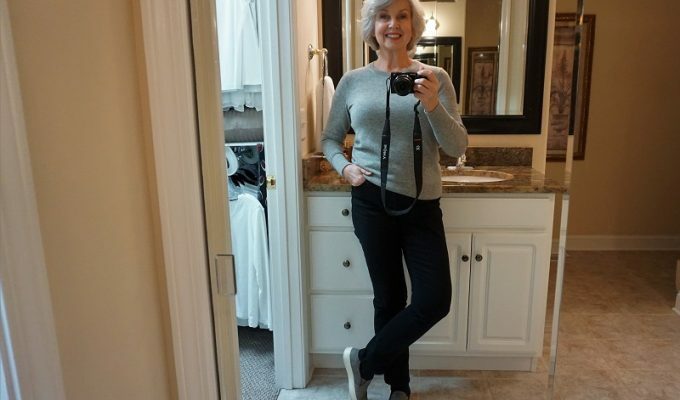 When I am at my best, I love to wear pretty exercise pants with a longer tee. I have been collecting the pants and curating outfits around them for a year. Even though some people find them inappropriate outside the gym, if done well, they are sporty and comfortable. Paired with sandals or ballet flats, they comfortably take me through an average day. Totally agree with everything you have said. I also work at home just part-time. I love fashion but didn’t realize that I only wore my “nice things” when I went out to dinner, the theater, a get-together, etc. My husband is the one who noticed and told me he likes to see my in my nice clothes. So out went anything old, faded, ill fitting. I really didn’t think he cared or noticed. Funny what what we don’t see. The Disney collection are Lularoe’s newest offering. While I’m not a Disney fan, I think the Lularoe leggings are the best out there. I’m not a rep…just a satisfied customer. Your look is so young and cute. I love it especially the leggings . You look wonderful so glad you showed us this look. Do you know the name of the legging pattern? I follow and enjoy your blog daily. Your style is so simple, classy, and well thought. So for the better part of my recreational google searching this week, I questioned whether a woman of a certain age should wear leggings, especially wild blockprint colorful leggings. Funny that I just received a purchase to match that description in the mail but couldn’t decide whether to keep them. Your picture this morning gave me a gasp and a big smile. If Susan wears them, then so will I. Thanks for helping me with my “big” decision! I was leaning that way, but you sold the look! As I get older, I find myself becoming more self conscious about my lounge around the house clothes. I live in an apartment building and no longer feel comfortable taking out the garbage or doing the laundry in those clothes. There also have been times when I have no answered my door because I would have been embarrassed for people to see me the way I was dressed. I have started to move toward wearing wicking workout clothes when I home. A step up from the old cotton running t-shirts and shorts/sweatpants and not embarrassing if someone rings my doorbell unexpectedly. I see so many middle-aged people, especially men, who leave their homes on weekends looking like homeless people. They think they are still teenagers and can run out without showering or shaving and wearing sweatpants and sweatshirts. It is atrocious and definitely not attractive. You are lovely, thank you for sharing. Susan, I’ve been a dedicated follower and your post today was right on! Since retiring I’ve noticed my at home presentation has become less than appealing, at times a bit embarrassed to answer the front door. A few days ago I started morning hair, makeup and outfit which led me to a major closet purge. Wow, how refreshing and boy do I feel and look so much better. So, thank you for another wonderful post! I agree. Nothing makes me happier than stepping into my closet and only seeing things I love. I did the Marie Kondo method and rid myself of all the stained and unloved things. Why not look and feel good just for me and the love of my life? 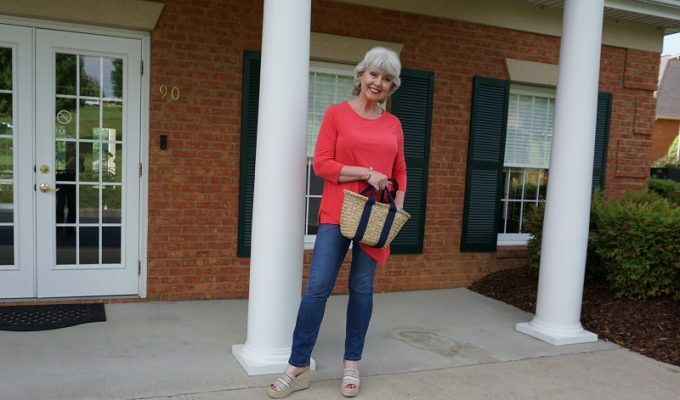 My at home look is a pair of my favorite dark wash Levi’s, a Lilly Pulitzer print top, and some darling metallic sandals in the summer. Easy but fun. Totally agree, Susan! You look darling in this outfit! I always follow the same routine staying in or going out for the day. Jump out of bed (well, I try!) shower, makeup, hair, dress. It’s just my thing and gets me off to a good start for whatever surprises the day holds. Love you, love your postings, pics, style! Thanks for being such a wonderful and uplifting inspiration to us all. Four years ago I retired and moved out of state to a very small town and no longer felt the need to put makeup on unless going uptown. I read your blog and you motivated me that I should look good no matter what as I don’t know who may show up at my door. Those words rang true and have since done that thinking of you every once in awhile. Thank you. I would love a weight loss post. What you eat on a daily basis, and any exercise routine. You are an inspiration!. How is sizing for Sunwoo. If I follow the chart I might be small but I do not like anything tight especially in the bust. I did purchase the “slash” top, you might recall in medium and it was perfect. The sizing for Clara Sunwoo is generous. I am finding that I enjoy the shorter tops with flat shoes. The size medium always works for me. I normally wear a medium or a size 1 at Chico’s. I am so glad you like the “slash” top! Love and adore you, Susan! But I’m not feelin’ those pants outside the house. But to each his own. C’est la vie! I love this look on you! You look so comfortable but still smart! What a cute outfit. Sure looks comfy in for lounging. I agree with all your points – right on!! I am a 61yr old lady from England and have never found ‘my style’ I have occassional panic shopping spree’s then regret most purchases. 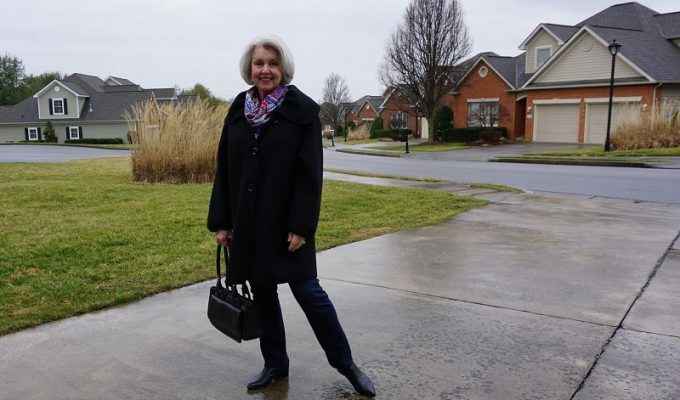 I came across your Fifty not Frumpy site recently and I was inspired by your style and your little tricks at styling your clothes, who knew you dont just pull something on and go!! Now I experiment with tucking tops in at the side or at the front etc wearing more jewlery and exkperimenting with tying scarves ready for our cold weather which is on its way already. I am reassessing my clothes some I am keepng as your tricks have given them a new look/life and now when I shop I am gong for block colour I really feel I may at last start to enjoy dressing in the mornings. I struggle with shoes can not wear high heels so I cant get quite the same look as you as I only wear flats any suggestions for that? Also I would lve to purchase clothes from America as cant get what I like here but not sure how sizing works? I am 8st 6lb 5′ 3″ size 10 or 12 here in the uk but to be honest I really struggle with getting a good fit, and a size 4 uk shoe. I read some of the comments people have made to you about ‘telling them what to wear etc’ please dont take any notice and carry on your postings there must be lots of us that feel inspired by you. Thank you from a grateful English girl!